I don't know about you, but there's not much opportunity for me to take my students on field trips even in our area, let alone internationally. I've always wanted to take my students to a Spanish-speaking country, but with lack of funding, safety concerns, and a bunch of other blockades standing in my way, it's just not possible right now. In the meantime, however, I stumbled upon a fantastic substitute that is free, easy, and, most importantly gets students exploring Spanish-speaking countries from the comfort of our classroom. All your students need is access to technology (tablets, computers, etc.) and a free Google account and they're on their way! 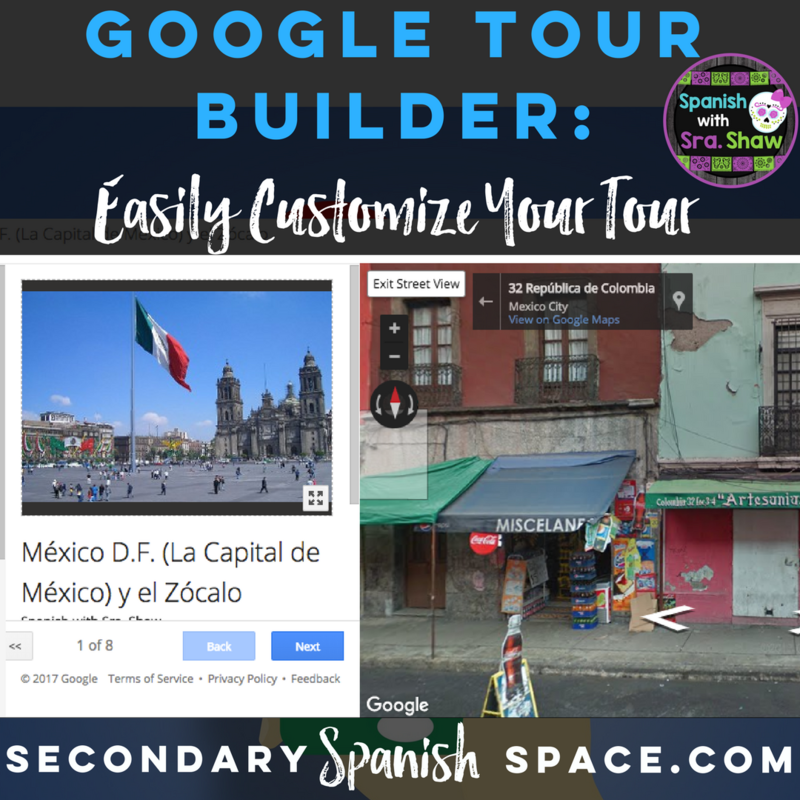 You can easily create your own tour or you could try out the Google Tour Builder I created of the Zócalo area in Mexico City. My 7th students happily "wandered" the streets of Mexico City for two days, visited the inside of Mexico City Cathedral, and shopped around the Ciudadela market. I provided students a guiding handout with questions about the videos I added to the tour and for them to record what they saw, but that's not at all necessary if you want to let your kids simply explore. Tours you create can be as long you'd like or can short, one-day lessons. I found that my students' curiosity and desire to digitally explore usually means that Tour Builder activities take two days, but I think it's time very well-spent. I'm pretty sure that most language teachers can look back on their lives and agree that the experience that changed us the most was traveling the world and seeing other places and people. When students enter StreetView in Google Tour Builder, they will be able to walk the streets and see people and how they live. Experiencing cultural similarities and differences will drive students' learning. My students had so much fun seeing how different the stores were in Mexico City, looking at architecture, seeing people sitting around in plazas, and just generally seeing how different life can be in other countries. No matter what your students are learning, there's a tour for that. If you are on a city or geographic unit, the applications are pretty obvious, but you could potentially gear your tour toward a variety of thematic topics. Next month, I plan on having my students "visit" schools in a several different countries in Latin America so they can compare them to their own educational experiences. If you want your students to learn about food, have them check out street foods around different Spanish speaking countries. If you're on a unit about housing, check out different types of places people live. Another really proficiency-based implementation I'm planning for unit I teach in the Spring is based around the new NCSSFL Intercultural Can Do Statements. One of the statements is "I can identify specific locations to have a meal, purchase a ticket, or buy something that I need." 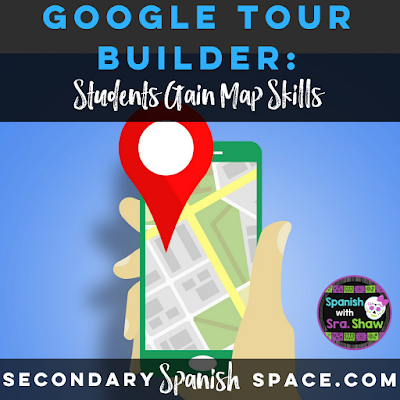 I plan on giving students a to-do shopping/eating list and then gearing a tour around having students use Google Tour Builder to locate places to complete the scavenger hunt. I know my students would love this of lesson and they'd be motivated to complete the scavenger hunt, plus I could totally trick them into learning. Go student-centered and let your students create a tour. You could have your students plan a vacation to a different Spanish-speaking country or create a day itinerary for a day in Sevilla including where to eat, what landmarks to visit, and where to stay. Tons of museums allow you to "visit" and "wander" their galleries using Google Streetview. There's so many possibilities for this! All of these ideas would perfect hit the new Interculturality Can Do Statements. Let's be honest, kids today will have no idea how to navigate even their own cities without the use of a map app. In an ideal world, we would be helping students to have a sense of direction and know the difference between north and south, but I would honestly just be happy to see kids know how the basics to use a digital map and have a concept of where a country is located. Plus, we'd be helping out our social studies colleagues who have to teach map-reading skills as part of their curriculum. 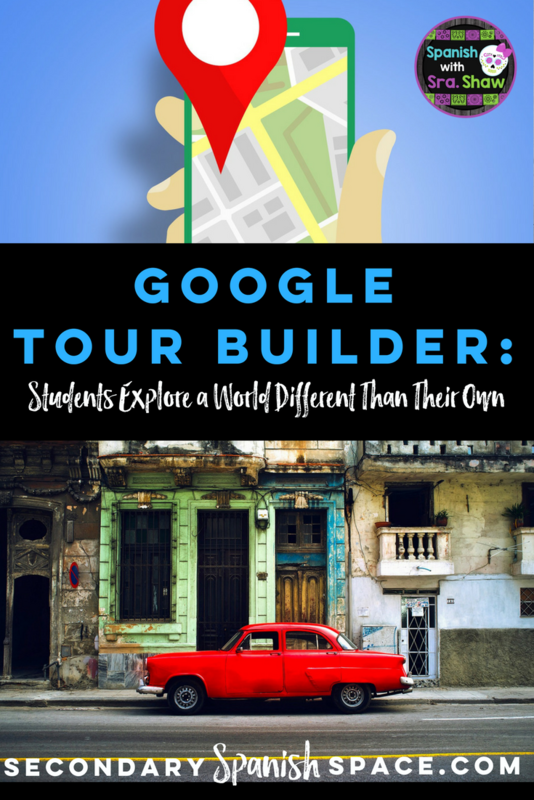 Here's a tutorial that shows you how simple it is to create your own virtual field trip using Google Tour Builder. If you create a tour, it would be amazing if you could comment below with the link so we could create our own gallery of world language lessons! 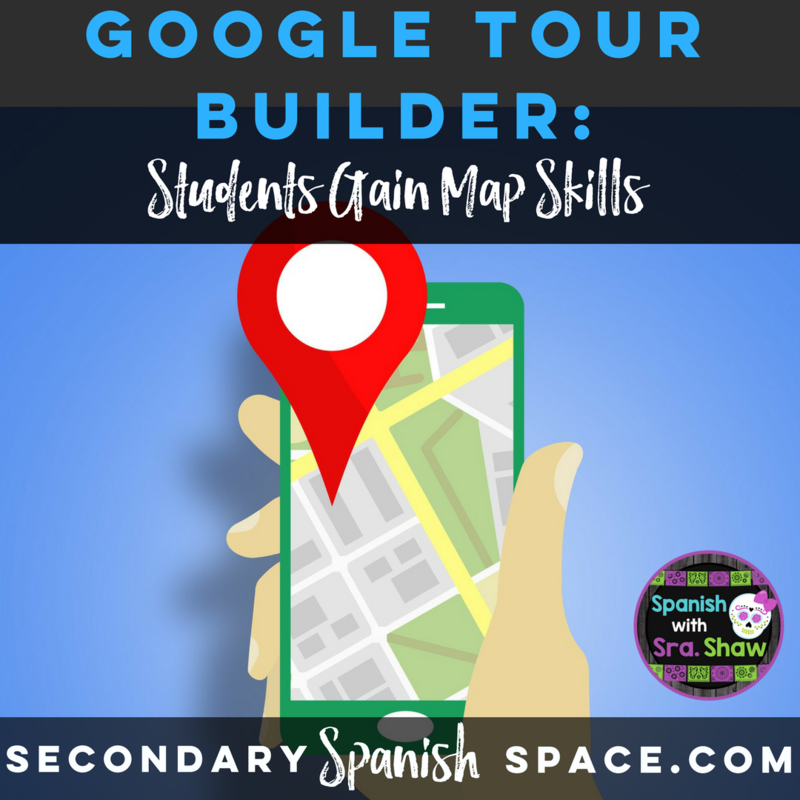 Where do you plan to "take" your students using Tour Builder? I recommend selecting a location that you either are working on as part of a unit or that goes with the vocabulary/concepts your students are learning. 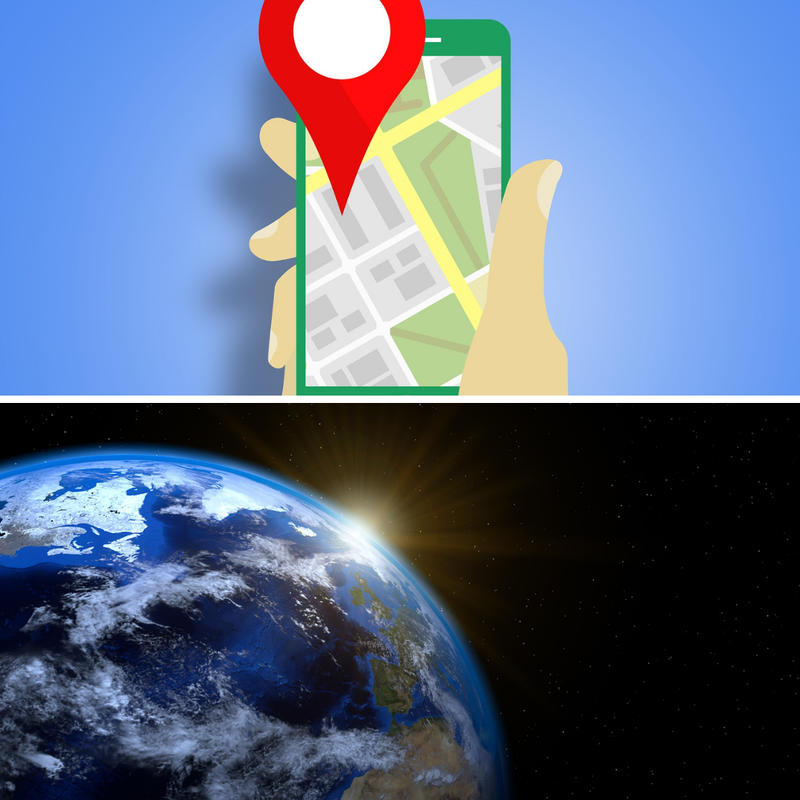 From there, find the most interesting and/or relevant landmarks to see and add photos and videos that help your students best experience all of the sites and sounds of the place they're exploring. I hope you're as excited about Tour Builder as I was when I found out about it! You'll love it because it's cultural and educational (not to mention student-directed) and your students will love it because it is engaging and fun! Try creating your own or save yourself the man hours at this chaotic time of year and use the Mexico City one I created here. Let me know if you have any questions! ¡Hola! I would like to share this idea with colleagues, but I have a quick question. 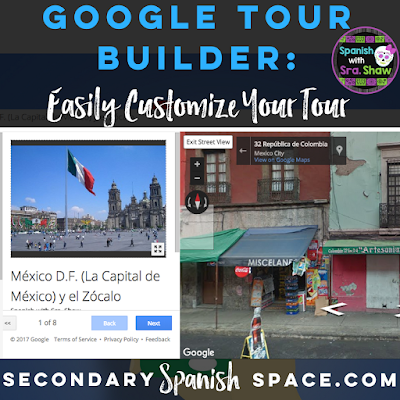 At one point, you say "Here's a tutorial that shows you how simple it is to create your own virtual field trip using Google Tour Builder", but I don't see any links or videos...Would you kindly share with me where I can find the tutorial? Muchas gracias!